The Business Ethics of J.R.D. Tata | Fourth Dimension Inc. The life of JRD Tata defines ethics and values in their truest sense showing us that it is possible to create a large, successful and yet humane organization. 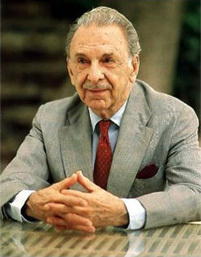 JRD Tata was the Chairman of Tata Sons, the holding Company of the Tata Group of Companies which has major interests in Steel, Engineering, Power, Chemicals and Hospitality. He was famous for succeeding in business while maintaining high ethical standards. Under JRD’s Chairmanship, the number of companies in the Tata Group grew from 15 to over 100. Monetarily, the assets of Tata group grew from Rs 620 Million to over Rs 100 Billion. In the public mind, ethics in business is mainly identified with financial integrity. Important as that is, the real meaning of ethics goes beyond that. The dictionary defines it as “the science of morals in human conduct, a moral principle or code.” It encompasses the entire spectrum of human conduct. Business ethics lays down how a person in business deals with his or her colleagues, staff and workers, shareholders, customers, the community, the government, the environment and even the nation at large. When he rang us in the office he would first ask: “Can you speak?” or “Do you have someone with you?” Except when he was agitated, he would never ask you: “Can you come up?” He was always polite. It is a measure of his affection that even after some of them retired he would write to them. He was always grateful and loyal. To him, ethics included gratitude, loyalty and affection. It came about because he thought not only of business but also of people. In dealing with his workers he was particularly influenced by Jamsetji Tata, who at the height of capitalist exploitation in the 1880s and the1890s gave his workers accident insurance and a pension fund, adequate ventilation at the workplace and other benefits. He wanted workers to have a say in their own welfare and safety, and he wanted their suggestions on the running of the company. A note that he wrote on personnel policy resulted in the founding of a personnel department. As a further consequence of that note came about two pioneering strokes by Tata Steel: a profit-sharing bonus and a joint consultative council. Tata Steel has enjoyed peace between management and labour for 70 years. Decades later, Tata Steel workers had received several benefits. Then JRD looked further. To put JRD’s ideas into action, the Articles of Association of leading Tata companies were amended and social obligations beyond the welfare of employees was accepted as part of the group’s objectives. In the 19th century, Baron Edward Thurlow, the poet, asked: “Did you ever expect a corporation to have a conscience?” The answer from J.R.D. Tata was: “Yes”. Whenever he could, he raised his voice against state capitalism. He never bent the system for his benefit. L.K. Jha recalled in 1986 that whenever JRD came to him when he was a Government Secretary, he came not on behalf of a company but the whole industry. He wanted no favours, only fairness. The J.R.D. Tata Centre for Ecotechnology at the M.S. Swaminathan Research Foundation was created in furtherance of his desire. Russi M. Lala was the director of Tata’s premier foundation – The Dorabji Tata Trust for eighteen years. His book ‘The Heartbeat of a Trust’ is based on this Trust. He has authored a large number of books including ‘Beyond the Last Blue Mountain: A Life of JRD’. He is also co-founder of the ‘Centre for the Advancement of Philanthropy’ and has been its chairman since 1993.